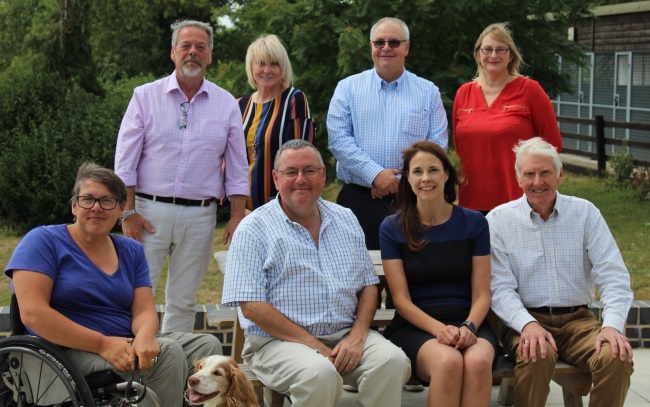 John joined the trustee board at Dogs for Good in 2015 and became chair of trustees in April 2018. John had previously been a director of Pets at Home joining the founder of the business in the early 1990s when it was only one store. He became a director in 1995 and helped to develop the business with Pets at Home becoming the biggest retailer in the UK pet sector with over 286 stores. John’s association with Dogs for Good commenced through a charity partnership with Pets at Home in the early 2000s. During his working life John saw how the presence of all animals, particularly dogs, in peoples lives brought huge benefits. This was only heightened when he first became involved with the charity and saw how dogs made so many life changing differences to our clients. As a trustee he is committed to utilising his skills and experience of his working life to help Dogs for Good – helping to see more people benefit from a specially trained dog. 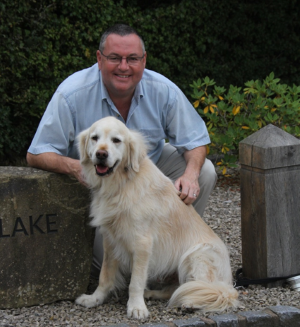 John lives in Cheshire with his wife, Jo, and their golden retriever, Kane, who they re-homed from Dogs for Good. John’s main interests are travel, cars, food and wine as well as being an avid watcher of many sports. John Starley – Following a successful career with many companies including ICI and Orchard House Foods, John set up as a freelance accountant. Ross Tiffin – Ross has held top level posts within the pet industry, including being managing Director of Hill’s Pet Nutrition. Ross now runs his own consultancy company working within the veterinary sector, has a significant role with International Cat Care and is a regular contributor to the vet press. Ross lives in Scotland and became a trustee in 2004. John Rutter – John retired from the post of Chief Executive of the Blue Cross in 2008 and joined the Board of trustees soon after. The Blue Cross is one of the UK’s largest animal welfare charities. Before joining the Blue Cross, John had a very successful career in industry. Trish Thompson – Trish is a client of Dogs for Good. Trish is Group Leader for a charity called the Back-Up Trust and has many years of experience devising and delivering training within the voluntary sector. Trish is also a trustee of the Lake District Calvert Trust. Ginette Bryant – Following a highly successful career in the animal pharmaceutical industry, primarily with Ceva, Ginette is now Business Director of International Cat Care. Ginette lives in Stratford-upon-Avon with her partner and two dogs. Louise Thomson – Louise is a committed charity professional with over 20 years’ experience working in and with charities, covering front line service delivery, volunteer management, training and development, and policy activities. She is Head of Policy (Not for Profit) for ICSA: The Governance Institute and works with regulators, boards and umbrella bodies to promote and support strong and effective boards. Louise has been a temporary boarder for Dogs for Good since 2014 and enjoys the benefits of socialising with the dogs in training. Annabelle Charman – Annabelle is Divisional Chief Operating Officer of Close Brothers Property Finance and a member of the Group Charity Committee, which is how she first encountered Dogs for Good and learnt about the life changing work they do for their clients. Annabelle had been seeking a trustee role with a charity which shared her core values and Dogs for Good was the perfect fit, with dog welfare at the heart of everything they do. As a trustee she strives to use her skills and expertise to support and maintain the quality and high standards of service which the charity provides to all of its clients. Throughout her childhood and teenage years, Annabelle helped to train and care for several of her own pet dogs and truly understands the happiness and unconditional companionship which a dog can provide. In her spare time, Annabelle enjoys long distance running and competes in various events throughout the year.